Researchers at the Rensselaer Polytechnic Institute, have developed a new nanotechnology-based “microlens” that could lead to a new generation of ultra-powerful satellite cameras and night-vision devices. The new nanotechnology-based microlens will lucky be used for infrared imaging and not spying on the general population… well that’s the idea. 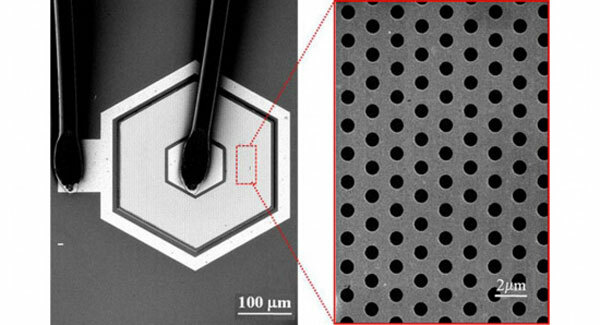 The new microlens uses gold to boost the strength of its infrared imaging capabilities by leveraging the unique properties of nanoscale gold to “squeeze” light into tiny holes in the surface of the device. Inside each nano sized hole are quantum dots, ultra-tiny crystals allowing images to be 20 x sharper than currently available. Professor of physics at Rensselaer and project leader, Shawn-Yu Lin, says the breakthrough is the first in more than a decade to demonstrate success in enhancing the signal of an infrared detector without also increasing the noise. “Infrared detection is a big priority right now, as more effective infrared satellite imaging technology holds the potential to benefit everything from homeland security to monitoring climate change and deforestation,” said Lin.